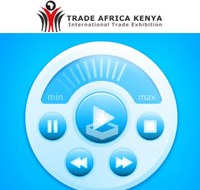 TRADE AFRICA - KENYA 2019, International Trade Show on Products & Equipment. The exhibition will be held from 22 - 24 February 2019, at Sarit Centre - Nairobi - Kenya. The Exhibition will attract exhibitors from around 15 countries and visitor from East African countries including : Tanzania, Congo, Sudan, Uganda, Rwanda, Botswana etc. TRADE AFRICA - KENYA 2019 provides a unique opportunity to expand your business network in one of the most astonishing business destinations in Africa. as Kenya's GDP has raised upto 55.24 from 37.2 Billions within 5 years. Kenya is the hub of East African market and biggest and most advanced economy in east and central Africa, The Country shares borders with Tanzania, South Sudan, Somalia, Uganda and Ethiopia.